This culinary journey I've partaken on is greatly due to the knowledge shared, stories passed, tales of lives once lived. Like that of Lee and his hand full of red peas. According to my grandmother and her colorful bedtime stories. Lee was a round man with short fingers and a slight chip in his front tooth. I'd say that's a somewhat vague way to describe someone. Yet like many of the characters that played out in her tales, I've conjured up my own images of them. Lee found himself in North Carolina by way of South Carolina, long before my time and that of my mama's. Made a name for himself by sharing his gift of a dish that he called ,Reezy Peezy. Or red devil beans as my grandma would refer to them. "Something that good ain't nothing but the devil"
A quick jaunt down the street and over a few more blocks would bring you right to Lee's doorstep. Here, the most bewitching aroma drifted through the crevices of his windows. Drawing you in like a proverbial fishing lure, right to the mismatched chairs surrounding his kitchen table. One of the hottest seats in town was among those mismatched chairs. On Sunday afternoon after singing praises to the Good Lord, you could join Lee over a dinner of red peas and rice. If you were lucky. But unlike the story of Jack with his magic beans and mythical giant at the end of the stalk. Or even the tale of Anansi, his hot head of beans and impatience, I'm unaware of how Lee's story ends. 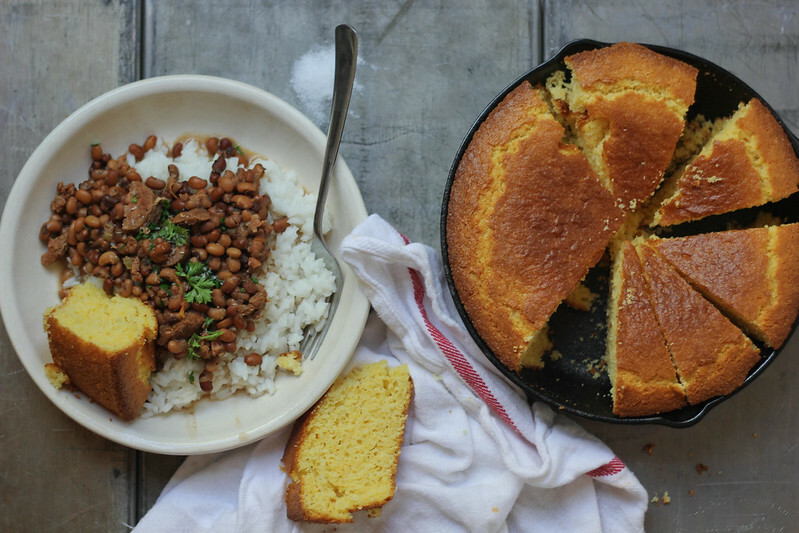 This open ended account of Lee would continue to fester my need to discover what those red peas were and how I could recreate that Sunday Supper. Much like my dear friend Pableaux Johnson and his invite only Red Beans and Rice Monday dinners that he hosts in his New Orleans home. Lee's Red Peas made him legendary, well atleast to the folks in that sleepy North Carolina town. Enough to become one child's bedtime story. 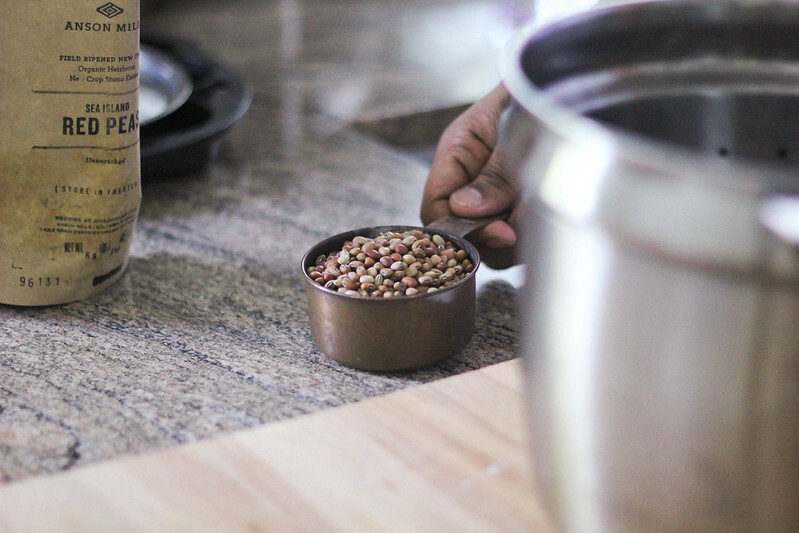 Heirloom legumes with African origins, Sea Island Red Peas were a mainstay in the improvement of antebellum rice farming. The production of these peas became eliminated during the depression, recovered by a few who were able to save them from extinction. 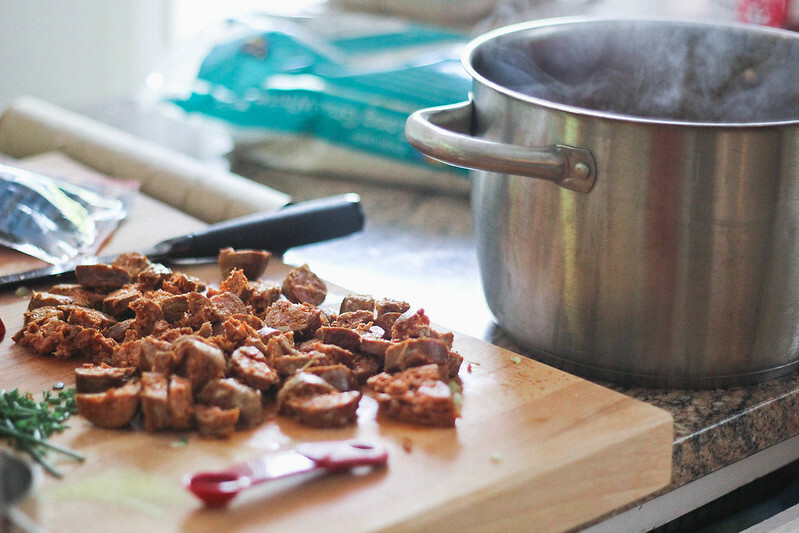 The illustrious Reezy Peezy, is a dish of Gullah descent made with unripe red peas. An African diaspora cuisine, put simply, is hearty red peas and rice. As I sit and think of new dishes to explore and share with those that dine around my table. I can't help but think of Lee, his warm pot of meaty peas with roasted vegetables throughout. Did he serve it with a heaping of cornbread like Pableaux on Monday nights. What did those who accompanied him think of this man and his hot pot of red stew. Did he become a captivating character in their great granddaughters bedtime story also? *The peas need to soak at least 3 hours- I would suggest over night. You'll see that I used chicken stock for these but I normally like to use homemade pork stock but chicken stock will work quite wonderfully. For my vegetarian friends, I easel modify this by using vegetable stock and removing the chorizo all together. For the peas- In a medium sized pot add the peas and cover with 6 cups of water; let soak for at least 3 hours. Preferably overnight in the refrigerator to achieve the best flavor. When ready to cook, bring the stock to a simmer over high heat in a heavy bottom saucepan. Drain the peas and add to the stock along with the onions, celery, garlic, thyme, bay leaf, red pepper flakes and chorizo. Partially cover the pot and cook the peas over low heat until the peas are tender. About and 1 ½. Season to taste with salt and pepper. 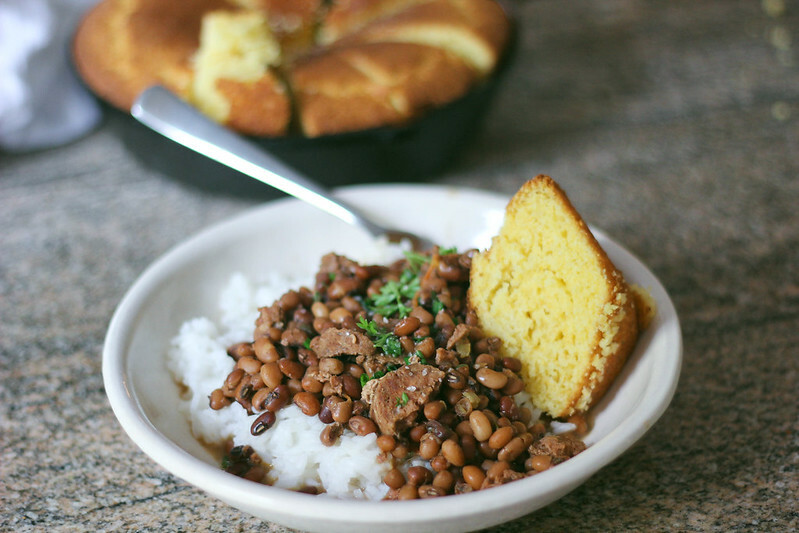 Ladle red peas over cooked rice and serve will with heaps of buttered cornbread.